Listening to Pig Destroyer is like watching a wild animal caught in a trap. Violent thrashing and growling aside, the two seem to share anxiety about the closeness of death. This passionate fatalism has defined the grindcore legends' sound from their early days as a band in Alexandria, Virginia. Now, having been a band for 20 years and growing to a five-piece, Pig Destroyer looks to go in a new direction. Exploring beyond the genre boundaries that they helped define in the midst of the tumultuous social storm of modern America, they have crafted one of this year's standout metal works with their new album Head Cage. It goes without saying that the sound of this album is ferocious. The ability of Pig Destroyer to consistently introduce and shed riffs and drum patterns induces the effect of a sonic whiplash so violent that it feels like the band is trying to tear the listener's head clean off. Complete with a listening disclaimer and howling electronics, "Tunnel Under the Tracks" generates a screeching tension before bursting into the discordant chords of "Dark Train" and the caustic tongue of J.R. Hayes takes aim. Known for his perverse and affecting expression, Hayes' lyrics on Head Cage are a portrait of a degenerate American wasteland. From stories of the macabre on "House of Snakes", the railing criticisms of police brutality on "Army of Cops", and twisted semi-poetic distortions of "Concrete Beast" this record is further proof of Hayes' lyrical ability. And although his scathing political calls are a welcome change for the band, it's his gruesome imagery like that of "Terminal Itch" (A tingling of the face / Became an itch that none could take / Now the girls decompose / With their pretty skulls exposed) that linger after a track ends. As a group, Pig Destroyer have managed to further evolve their hard-to-pin-down sound without sounding out of context with the rest of their discography. Guitarist Scott Hull reports actively trying to avoid 4/4 time signatures and blast beats as much as they could in the recording process to keep themselves at least an arm's length from their comfort zone. The added elements contribute an extra layer of madness like the weird, crackling electronics and ominous samples of laughter and screaming on tracks like "Circle River" and "Army of Cops". Perhaps most encouraging is the fact that the band can still deliver a battering breakdown like that of "The Torture Fields" while dabbling into genre territories of sludge and post-metal with their most experimental song to date, "House of Snakes". 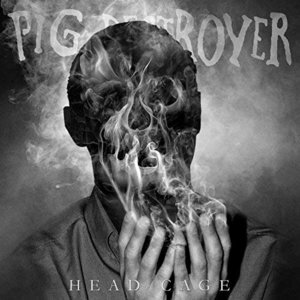 What's daring about Head Cage is that Pig Destroyer have chosen to travel in a new direction situated within a genre that contains fans who are notoriously averse to change. Their socially transgressive lyrics and musically daring effort may lose the group some listeners. But reinvention after reinvention they have proven themselves to be a metal group who perhaps even enjoys tormenting their fans and who assuredly are afraid of no one. It is more within their style to illicit fear anyway.